FiberGuide is your one stop shop for Carrier Ethernet services from multiple providers. Contact us to help you select the most suitable service for your technical requirements and budget. With our Business Ethernet Selection Tool, you can start the process of comparing service plans. Carrier Ethernet Services are extension of the well-known and popular low-cost Ethernet based LAN networks to Wide Area Network (WAN) applications. Ethernet now competes with and/or compliment other transport networks in transporting voice, data and video services over long distances. Like native Ethernet, the biggest advantages of Carrier Ethernet Services are low cost and scalability. If your business or service offering is just starting, you may only need low speed access such as 10Mb/s or 100Mb/s. As requirements change, it is easy to make upgrades in small increments. 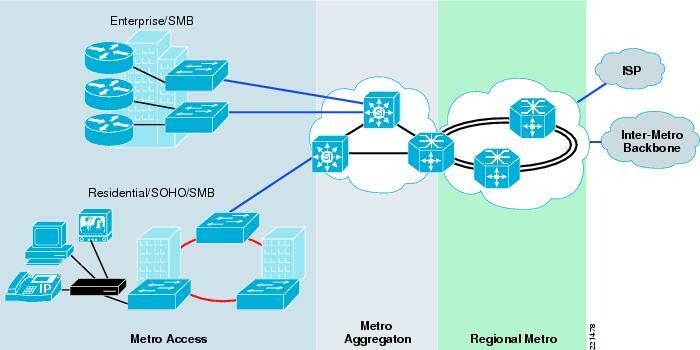 Data rates can be increased up to 1GbE, 10GbE or even 100GbE depending on availability. Carrier Ethernet Services are available as point to point or multipoint connections over dedicated physical or virtual connections. One other advantage of Carrier Ethernet Services is that they can be accessed over a variety of ways: fiber optics, high speed Digital Subscriber Line (DSL), Hybrid Fiber Coaxial (HFC) or cable, Wireless or T1 lines. While T1 lines are very popular, trusted and are still very widely used, their data rates are very low by today’s standards. Unbonded T1s are only 1.5Mb/s. Carrier Ethernet Private Lines can replace T1 lines while offering higher speeds at much lower cost/bit. Businesses can use Virtual Private Lines (VPL) to connect one or two locations to the Internet through a Carrier Ethernet Network. A VPL connection is dedicated and not shared with others outside the organization.